This wedding-friendly villa is within walking distance to amazing resort amenities, restaurants, and an 18-hole golf course in a gated community. The villa itself has a tropical back terrace with a freeform pool, a swim-up bar, and tons of lounging space. The bedrooms are perfect for multiple families, because there’s five king suites, two double suites, and a bunk room. I highly recommend this for a Costa Rican wedding or celebration. Located in Los Suenos Resort! 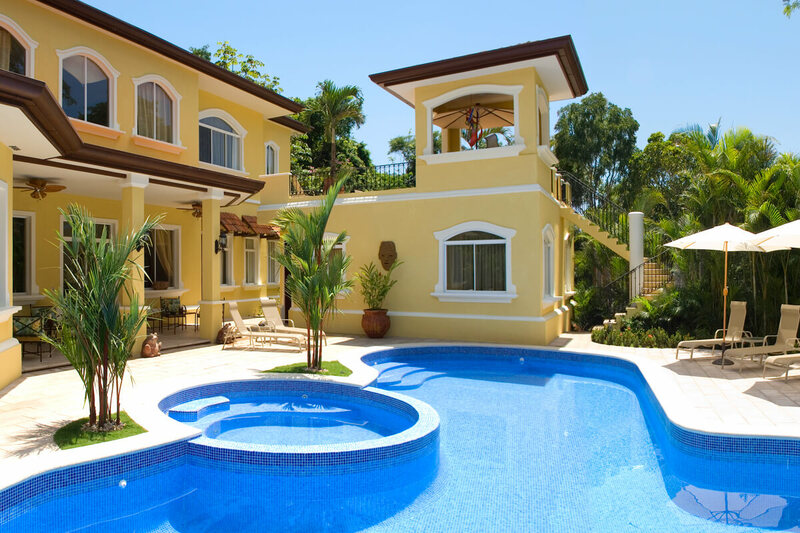 Casa de Suenos stretches across 8,000 square feet of Los Suenos, a gated resort community near Marina Village. Views of La Iguana Golf Course and lush, tropical landscaping combine to create a truly tropical setting for this sunny vacation rental. The contoured swimming pool features a built-in hot tub, wading area, and a swim-up bar. The surrounding loungers benefit from sunshine and mountain views, while wrought iron furniture under the verandas provides shaded dining and living space. The dining veranda also has a flatscreen TV and a BBQ grill for the full al fresco experience. Sliding glass doors lead into Casa de Suenos’ bright and airy interior. Air-conditioning and WiFi are available throughout the home, and high ceilings add luxury. There’s comfortable furnishings and a full entertainment system in the living room, a lounge for playing board games or sipping morning coffee, and a sunlit dining room with seating for 12. The spacious kitchen features a large breakfast bar, stainless steel appliances, a prep island, and an adjoining wet bar. Large groups will love the commercial fridge/freezer and oversized stove. Seven suites and an additional bunk room accommodate up to eighteen guests. There are five king suites and two bedrooms with two double beds each. The bunk room has a bunk bed and a day bed. All eight bedrooms have a TV and an ensuite bathroom with a standalone shower. Housekeeping and 24-hour security keep the villa in top condition. Casa de Suenos is within walking distance to Marina Village, the golf course, boutiques, and the Los Suenos beach club. The villa has an ideal design for weddings, special events, and retreats. Rates do not include: tax of 13%. There is a 4 minute drive to the Los Suenos Beach Club. Upon arrival at the airport guests will secure a rental vehicle or taxi (guest expense) and drive to the villa using directions provided. Welcome package, access to Los Suenos Beach Club, marina Village, golf course (rental clubs available), and restaurants. Some of the amenities available through the hotel may require a pay per use fee.